Maybe I'm completely late on this (chances are, yes), but if I am I'm guessing others are too, so let's all catch up together! You know how sometimes you hear about something or learn about something and you're just like YES this is something that is so true and/or so needs to happen? That's how I felt when I first came across EVE's website. There isn’t a single national holiday named after a woman. Not a single woman graces our paper currency. Only nine of the 100 statues in National Statuary Hall are of women. Less than 25% of the postage stamps issued by our government to commemorate individuals are of women. The overwhelming majority of streets are named after men. In New York City there are 150 statues of people: 145 are men and 5 are of women. The overwhelming majority of schools are named after men. 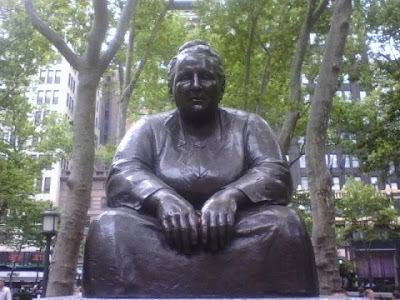 Read about this Gertrude Stein statue here. Being an Ohioan, I know how proud this state is of the Wright Brothers and Grant, and I have a hard time believing one of those two won't win on name recognition alone. (Edison is wildly famous, of course, but if I remember correctly he didn't really live in Ohio, he was just born here.) From this list, Upton would be my personal choice. Only Ohioans can cast a vote on what statue will go up, but a group like EVE can play a big role in pointing out why women should be considered for honors such as this one. Ms. Blog: "How About Sojourner Truth on the $5 Bill?" Washington Post: "U.S. needs to face up to sexism on its paper money." WTF, New York Times? You cannot be serious.